Besides our wonderful coral reef providing world-class scuba diving and snorkeling the waters off the Florida Keys are also known as fabulous fishing grounds. 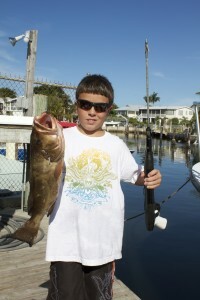 Islamorada is called the “Fishing Capital of the World” for a reason! We all like tasty fresh fish for dinner but as divers we also like our fish where we love to see them – on the reef! 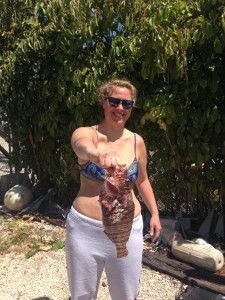 Therefore, Florida Keys Dive Center offers spearfishing charters on selected trips only or we provide the boat with captain and crew for half day or full day private charters. We have dedicated locations where individual divers and also groups in the past have been quite pleased with their catch. The best spearfishing around here is done in intermediate depth to deep water so we do require an advanced level certification or proof of deep dive experience within the last year. Each diver is required to either have their own fishing license or to participate in our boat permit ($20 per person for a 3-day pass), no exceptions. If you have not done so already please familiarize yourself with the Florida Saltwater Fishing Regulations. The price per person for a spearfishing trip is $150 plus tax including tanks (air) and weights. You also have the option of chartering one of our boats for your private group. Please inquire about private charter rates. Divers who spearfish the first time or are rather inexperienced are required to take a one day Underwater Hunter and Collector Course ($249 plus tax per person). This course entails a classroom portion in the morning where we talk about marine life, ecology, and conservation aspects, collecting and spearfishing techniques, spearfishing rules, applicable laws, gun handling, and gun safety as well as fish identification. The course also includes two instructor guided dives, during which you will do some target shooting practice and actually will have an opportunity to hunt. 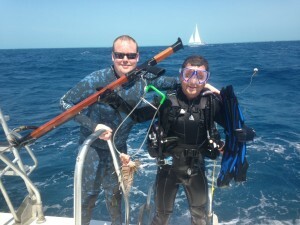 A spearfishing guide is $100 for one person or $75 per person for 2 or more people (max 4 divers). Spear guns are available to rent at $40 per half day charter.